Reliance Foundation Youth Sports Founder and Chairperson Mrs. Nita Ambani received the prestigious Rashtriya Khel Protsahan Puruskar 2017 on behalf of Reliance Foundation by the Honourable President of India Shri Ram Nath Kovind. 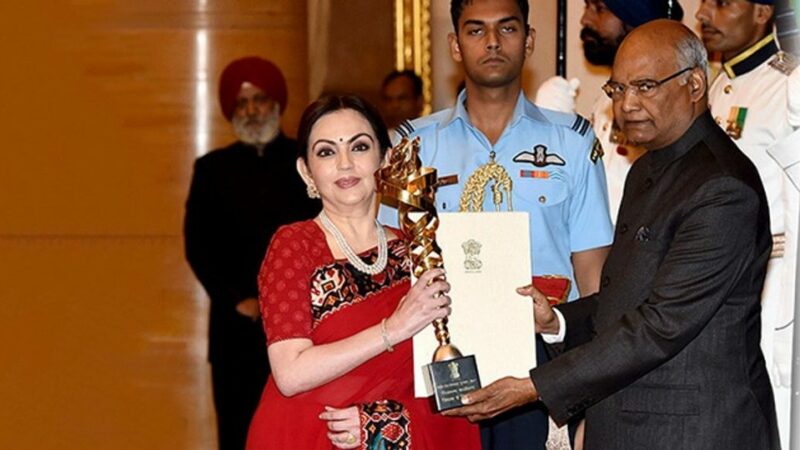 The award was given by the ministry of sports affairs to Mrs. Ambani, who has been influential in transforming India into a multi-sports nation. The Reliance Foundation Youth Sports national football championship was launched last year with an aim of providing a platform for youth sports in India, especially at the school and college level. In the inaugural edition, RFYS involved four different categories and was played in eight cities - Chennai, Mumbai, Kochi, Kolkata, Goa, Guwahati, Delhi and Pune. It was an instant success with the young budding athletes showcasing their potential to achieve their dreams. The main success story in the competition was Ajith Sivan, who caught the eye of the Indian Super League franchise Kerala Blasters and was roped in for the 2017-18 season. The second edition of the Reliance Foundation Youth Sports kick-started on 16th August in Kochi, Kerala, and this year it has been expanded to 17 cities – with the additions of Aizawl, Shillong, Imphal, Chandigarh, Ahmedabad, Kozhikode, Bengaluru, and Delhi. In the first year the competition reached out to 2 million children and the goal this year is to reach out to 4 million children.